As part of an effort to promote volunteerism and women's leadership, the United Nations Volunteers (UNV) programme in the Central African Republic organized a capacity-building workshop for girls' organizations on the UN Online Volunteering service. The training took place in July 2018 at the headquarters of the National Youth Council of Bangui. 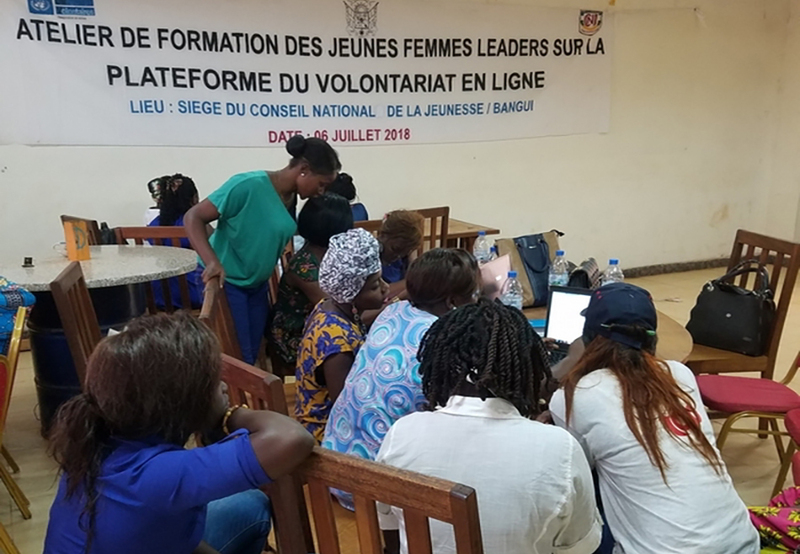 Capacity-building training for young women leaders in Bangui on the UN Online Volunteering service. Mr Mongombe invited the participants to accompany the process of setting up the national infrastructure of volunteering in progress and to make good use of the tools made available. The training was delivered by Irena Kazenaite, UN Volunteer Recruitment Specialist in the Volunteer Support Office of the United Nations Multidimensional Integrated Stabilization Mission in the Central African Republic (MINUSCA). The sessions focused on the mandate of UNV, the features of the online volunteering platform, how to create an online opportunity, mobilizing volunteers, sharing experiences and success stories. A practical orientation phase was also organized and enabled participants in 12 working groups to take ownership of the tool. The training was punctuated by several team building exercises and songs to strengthen the cohesion within the groups. At the end of the training, more than 10 participants created their profile on the online volunteering platform. While expressing their gratitude, they asked the UNV programme to keep on providing support and guidance until the creation of the accounts of their organization is finalized. However, many young female leaders do not master the computer tool and do not have an e-mail address that can allow them to access the platform. UNV, in agreement with the National Youth Council, has therefore decided to initiate a computer training programme for the women.